If you confirm the problem is the DC to DC, what about a Schottky diode in one of the connecting cables to stop back flow? I have been following your excellent detailed build, great things never happen over night but the finished product will reflect the care you have put into the build. Last edited by T1 Terry on Wed, 01 Jan 2014, 14:30, edited 1 time in total. T1 Terry wrote: If you confirm the problem is the DC to DC, what about a Schottky diode in one of the connecting cables to stop back flow? Mm diode logic is new to me but would that not let me use the battery's current but then restrict it being charged by the DC/DC or vice versa? 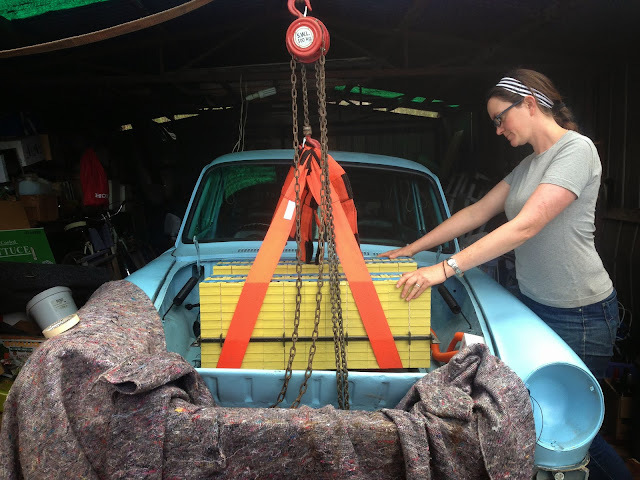 Restoring and converting a 1969 VW Type 3 Variant. Still waiting for her front battery pack. Once this drops in there's only a few final HV connections to make before I can do the initial charge. I've come up against a aux battery drain problem though. I've wired the DC/DC convertor to the small 12V 7amp hour cell, this supply then runs up to the e-stop in the dash and onto the rest of the car via the fuse box etc. When the e-stop is open and everything is turned off the aux battery is draining overnight. The DC/DC being the only possible source I can identify. I found -- after a flat battery -- that my DC/DC was drawing 85mA from my auxiliary battery even with everything switched off. So I installed a relay in the line from the DC/DC pos output to the main fuse box positive terminal, the activating coil of which was switched with the accessory ignition switch position. When the HAZV is on, the current flows through the diode to the 12V battery. When the HAZV is off, the diode stops the current flowing in reverse back into the DC/DC converter. That's what diodes do, they let the current flow in the direction of the arrow, but stop it flowing backwards. You can connect all your normal 12V stuff on the right of the diode. If there is anything that you want only on when the DC/DC converter is running, put that on the left of the diode. Terry has suggested a Schottky diode because other types will "use" a bit of voltage (typically 0.6V or so), reducing the voltage seen at the battery, and possibly getting hot. Schottkys are better, with a smaller voltage developed. At least this is what I read on Wikipedia - I haven't ever used one myself! You'd need a diode that could handle all the current that the DC/DC converter puts out. Do you know what the output current specification is? 4Springs wrote: Do you know what the output current specification is? Thanks for the diagram Chris! That makes sense now. The IOTA can output 55A max so from what you've described I'd want a Schottky diode that can handle 12VDC 55A. From what I gather that's a tall order? Thinking on it further this afternoon I realised I could potentially switch the DC/DC to aux battery cable via a 2NC E-Stop in the dash. Currently my ignition switch only controls the motor controller, as I'm relaying on the the existing 1NC E-Stop to turn everything else off. So in switching off the vehicle I would be opening both the aux batt and main 12V circuits in one hit. Watch your current ratings if switching this line using your E-Stop switch. 55A is quite a thick wire, and it will need a hefty switch. When I was wiring from the DC/DC to the aux battery I used the existing wiring at first. I turned on every 12V accessory that I had - lights, wipers, brake lights etc. The wiring soon started to smoke, so I replaced it with a bigger wire. When even that got warm I used a larger one still! Or you could use a relay like Renard suggested. Then you can have a relatively light-weight switch on the dash, that in turn switches a more hefty relay out under the bonnet. That relay can be a 2NC version if you like. 4Springs wrote: Or you could use a relay like Renard suggested. Then you can have a relatively light-weight switch on the dash, that in turn switches a more hefty relay out under the bonnet. That relay can be a 2NC version if you like. I used a relay to isolate my DC-DCs from the 12V 9AH battery for exactly the reason that you have found Jem. It's very convenient to turn the car off and know you can leave it for months if necessary with no regard to any battery issues. Mine was an overkill because I already had it. It's coil is wired across the traction contactor coils. It's Normally Open contacts are between the DC_DC output and the battery. It also means that you can run some stuff straight from the DC-DC output (in my case the motor fan which again has it's own relay) and they can't drain the 12V battery. Schottky diodes are not much use here as they drop almost as much as silicon at high current - plus it's a lot of loss and heat. Relays are a better fit here in my opinion. Narva have a 70 Amp relay with a coil that only draws 100mA. Last edited by Johny on Mon, 06 Jan 2014, 04:22, edited 1 time in total. Last edited by seligtype3 on Mon, 06 Jan 2014, 06:28, edited 1 time in total. Thanks for the tips on the DC/DC isolation situation guys. I think I've wrangled a way to switch the aux battery on the dash. An new illuminated switch beside the e-stop will hopefully remind me to switch it off as I shut the rest of the car down. Until everything is powered up and running my diagnostics are limited so I'm pushing ahead with getting the traction pack live in order to have the DC/DC running etc. It's been a long time coming but today the motor turned over in neutral. The SolitonJr had me thinking it was failing to start for some time, the fans come on, the dash light flashes and then it goes dead with a thud, or so I thought. It turned out after much head scratching that it was on and engaged and only needed some throttle to make the Kostov purr. One step forward. The Elcon charger is the next challenge, I'm yet to have it acknowledge the pack, closing the Enable and 12v lines gets a series of flashing green and red LEDs, indicating the pack isn't connected. Despite it being wired and all HV contractors are closed. Any tips out there? seligtype3 wrote: The Elcon charger is the next challenge, I'm yet to have it acknowledge the pack, closing the Enable and 12v lines gets a series of flashing green and red LEDs, indicating the pack isn't connected. An outside chance: do you have the whole pack connected? We found our 417 V Elcon charger would only charge a minimum of about 200 V worth of cells. Less than that, it deems the pack to be faulty, and gives the same error LED sequence as no pack connected. 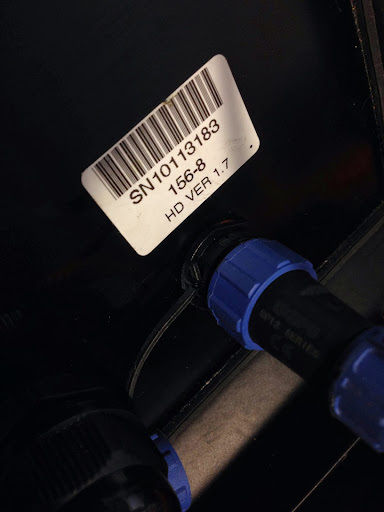 "RGRGRGRG Battery not connected or out of specification or DC output fuse blown (or waiting for CAN command)." Something I learned was that you have to use the 12V from the charger. I made the mistake of using my car's 12V line. I connected charger GND to chassis GND, and 12V AUX to charger 12V. This is not correct, you need to keep them isolated from the car. So just connect charger 12V to ENABLE. I think this is what you have done, but I thought I'd mention it just in case. So just connect charger 12V to ENABLE. I think this is what you have done, but I thought I'd mention it just in case. Thanks for that, I'd come to that same conclusion after sticking a multimeter on the two wires and getting 12V. When I connect them to enable charge I now get a soft electric whine from the charger and it flashes as if charging for two seconds. Then cuts out and resumes to RGRGRGRG flashing for 10 seconds and then whines and tries to charge again. This continues to loop. Weird. When I have a multimeter on the charger output terminals I get the packs 148V but if I break the traction circuit with the big red button on the dash during the 2 second charge attempt then the multimeter gets a moment of 164V (which is what the charger is rated to output). I'm well confused. I opened the case up to check the DC output fuse but the 20 year old dinky multimeter packed it in most inappropriately. The e-expert pro: for the moment I've wired this across 5 cells on the mid pack to avoid the shared ground issue caused but the pre-scaler. I figure it pulls such a small amount of power that it's unlikely to unbalance things. I'll be keeping an eye on this though. So close but without a charger I can't prime the cells. Speaking of which the TS cells come with a slip saying that they must be charged to 4V before use but my charger will only do 3.65V. Does anyone know if 4V is a must? Last edited by seligtype3 on Sun, 26 Jan 2014, 16:53, edited 1 time in total. seligtype3 wrote: When I connect them to enable charge I now get a soft electric whine from the charger and it flashes as if charging for two seconds. Then cuts out and resumes to RGRGRGRG flashing for 10 seconds and then whines and tries to charge again. This continues to loop. Weird. When I have a multimeter on the charger output terminals I get the packs 148V but if I break the traction circuit with the big red button on the dash during the 2 second charge attempt then the multimeter gets a moment of 164V (which is what the charger is rated to output). I'm well confused. I opened the case up to check the DC output fuse but the 20 year old dinky multimeter packed it in most inappropriately. What voltage is your charger configured to cut out at? And how many cells do you have? I have a TC Charger, which is apparently the same charger. 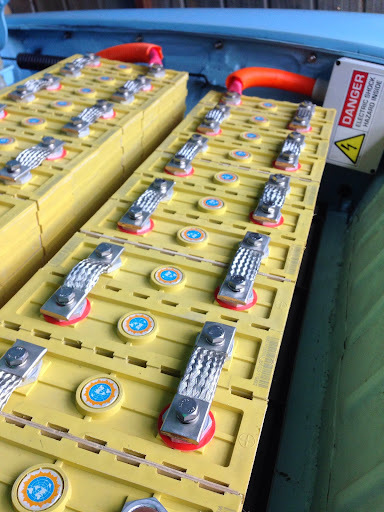 Mine is model number TCCH-H175.2-12, which means that it will cut out at 175.2V (48 cells x 3.65V). One extra test I thought that you could do is to connect ENABLE and 0V to see what happens. When I do this on mine the charger flashes green to indicate a full battery. I don't know what this will prove, but it is another test you can do! 4Springs wrote: What voltage is your charger configured to cut out at? And how many cells do you have? I have a TC Charger, which is apparently the same charger. Mine is model number TCCH-H175.2-12, which means that it will cut out at 175.2V (48 cells x 3.65V). Thanks Chris, the ENABLE and 0V (GROUND) hook up did as you suggested and flashed green. As you say, I'm not sure what this proves either. 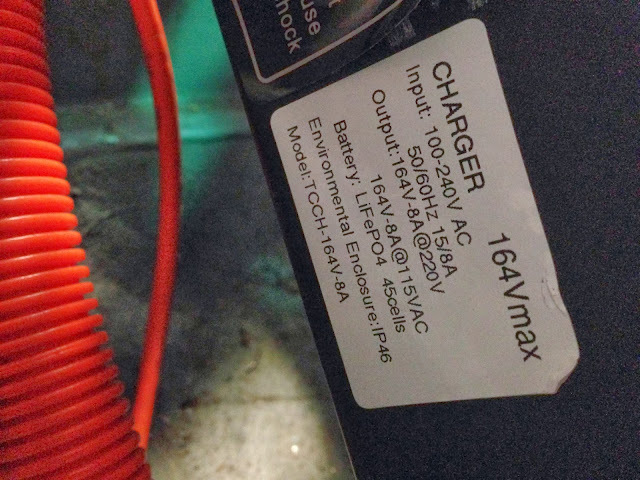 Here's the specs on the charger: there are two stickers on it which conflict slightly, see below. I have 45 cells, 160Ah, current state of charge 3.1V or 148.7V. I tested the DC output fuse with the new multimeter (thanks to Buntings for being open on a public holiday) and it checked out ok.
One other variable is the Ah settings you can cycle through with the hidden button under the sticker on the side. I went through all 10 options yesterday and all settings rendered the same RGRGRGRG result. I have no idea which mean what as there's no information regarding these. Does anyone have a chart for the Ah settings on these chargers? The output leads are black and white, I've treated black as neg- and white as pos+. Last edited by seligtype3 on Mon, 27 Jan 2014, 05:39, edited 1 time in total. My impression of the different charging curves is that if you ordered a charger with different options, this is how you change them. My manual suggests that there would be a sticker listing the different options if you have any. I've been playing with mine this morning, and it does the RGRGRGRGRG when the ENABLE line is not connected. It also does it if I have the battery isolated. If it is connected to 0V it goes GGGGGGG. 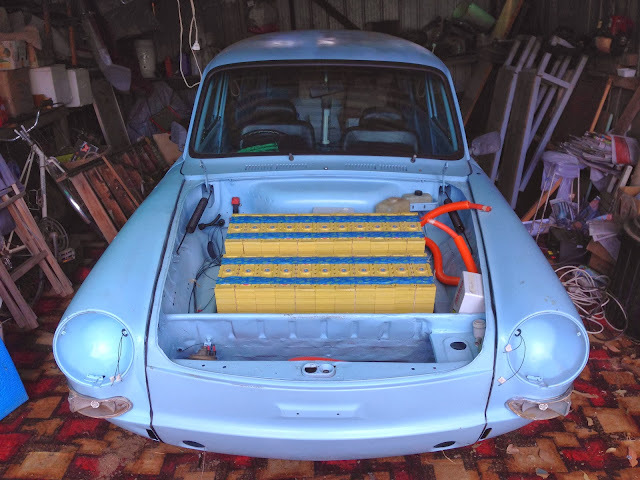 If it is connected to 12V then it goes RRRRR (and starts charging). Output colours are interesting, mine are red and black. According to google the white is normally positive, like you have it. Have you tried connecting your multimeter to the output without the battery connected? You could presumably check the polarity that way. And while we're talking colours, the ENABLE wire is black, 12V red and 0V green. seligtype3 wrote: ... I'd come to that same conclusion after sticking a multimeter on the two wires and getting 12V. When I connect them to enable charge I now get a soft electric whine from the charger and it flashes as if charging for two seconds. Is it possible you are assuming that the black wire is ground, and the green is enable? In that case, you would actually be shorting interface 12 V to ground, which might cause the charger to reboot after a 2 second or so delay. Yet shorting enable to ground still works if you have the colours swapped in your mind. Great project. Looking at a possible Type 3 to convert. Any update on completion, performance etc?